The Persian is number one of the top ten cat breeds in the USA, right next to the Siamese. Persians are known for their extremely long luxurious coats of hair that come in an astonishing number of colors from a Solid Color, Silver and Golden, Shaded and Smoke, Tabby, Bi color, and Himalayan). They are known for their lovely round eyes, flat faces, short bodies and stocky legs. Female Persian weigh up to five pounds while the males are up to seven. 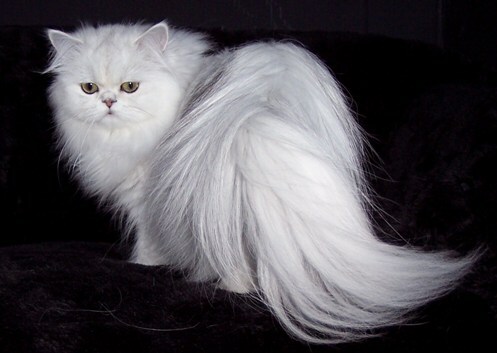 The Persian have gentle personalities and are creatures of habit. Their quiet, melodious voices are pleasant and nonabrasive. They communicate delightfully with their large, expressive eyes and make charming pets for all ages. These cats were called Persian for their country of origin Persia the country of Iran today and have been a popular breed since the early 1600.